You are here: Home » News » Smashed project visits Abbey! 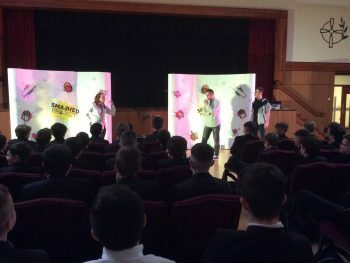 This is the second year we have invited the Collingwood Learning Team to the Abbey to present their alcohol awareness drama workshop to our Year 9 students. We feel it’s a hugely important topic to address with younger students as we try to positively influence their attitudes towards and relationship with alcohol once they reach the legal drinking age. below is an account of the workshop from one of our Year 9 students, Eoghan Fitzpatrick-Harkin. It started off with a short thirty-minute performance on how alcohol can affect under-age students in day to day life. It began in a park where three friends were drinking alcohol, and this started an argument. The next scene shows us a classroom and a teacher talking to his student. This show us how hard it is for students to ask for help. In the end it showed us the terrible outcomes of under-age drinking. We then were asked questions on the performance and asked our opinion on under-age drinking. Altogether it was a very fun and educational performance. The workshop stressed the point that the more we, teachers and parents, talk to our young people about alcohol consumption, the more likely they are to adopt a healthier attitude to it. The earlier that conversation happens the better. We can make sure they understand the risks and dangers associated with underage drinking and help them make informed and responsible choices around alcohol as they grow older.